Today in Australia there are more than 500, but when the large tract of unspoilt bushland in the Port Hacking district was dedicated by Lord Loftus as a national park on 26 April 1879, it was the first of its kind in this country and the second in the world after Yellowstone in the United States. 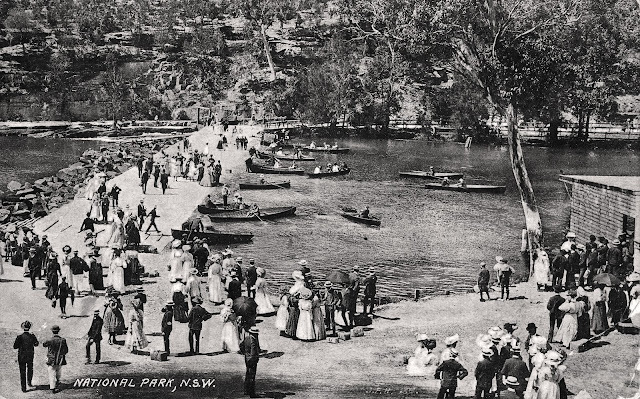 The National Park (it gained its Royal title in 1954) largely owes its existence to the foresight of Sir John Robertson, a Premier of New South Wales, who comprehended the future health benefits of preserving parks and reserves as the ‘lungs’ of a city. Initially just over 7000 hectares of Crown land was proclaimed as national park but following the overwhelming endorsement of public opinion this area was soon extended to 16000 hectares. In the early days the desire to ‘civilise’ the National Park led to ‘improvements’ including the clearing of under-scrub, the creation of English park-like ornamental gardens and the introduction of exotic flora and fauna including, in 1886, five Rusa deer whose descendants still roam the park today. When Audley causeway (pictured) was constructed in 1883 it not only provided access to the eastern bank of the Hacking River, but created an ideal location for those wishing to enjoy a tranquil weekend of boating. Additionally, damming the river ensured that the upstream waters, now separate from the saltwater below, were suitable for the ‘acclimatisation’ of introduced freshwater fish like English perch and trout. Concepts of conservation have indeed developed over the years, yet without the forethought and perseverance of those who created its foundations back in the 19th Century, we might not be able to enjoy the Royal National Park today. In a few years Sydney is expected to have a population of one million. A vast numerical increase in the number of the population is bound for the next half century at least to mark our domestic history, and amid all the multiplying changes in the passage of coming decades, the National Park will remain much in the same condition as it now stands, excepting, it may be hoped, that the barren heath, secluded dells, and sea beaches, now almost abandoned to the birds of the air, will resound on every holiday with the voices of jocund crowds of pleasure-seekers, freed from the rush and turmoil of everyday life. The primeval forests will remain untouched. No woodman’s axe is permitted to lay low the lordly forest trees, which are allowed to bring forth their springtime buds and shed their withered leaves so long as the trees stand and the roots hold fast. The national heritage is safe beyond the reach of plunder, safe from the machinations of ambitious schemers, and secured to the people of this country upon express terms fixed and made final by Act of Parliament. It is Time, and Time alone, that will prove the vast value of this magnificent dowry to the people of New South Wales.